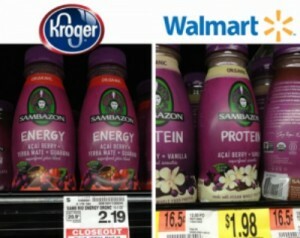 Free Sambazon Juice at Walmart & $0.19 at Kroger! NOTE: To change the zip code, click on the "Local Coupons" tab, enter the zip code in the box and press the little arrow. Then, click the "Coupons" tab to see the regular coupons. Thanks, Deal Detecting Diva and Mommy Want Freebies!